A suicide car bomber hit the Iraqi justice minister's convoy as he left home Saturday, killing five bodyguards but leaving Malik Dohan al-Hassan unharmed. Three people, including a police chief, died in other attacks throughout the country. In a second suicide bombing, attackers hit the Iraqi National Guard headquarters in Mahmudiyah, 20 miles south of Baghdad, killing two people and wounding 47, hospital officials said. Gunmen also ambushed and killed the Iskandariyah police chief as he drove to work in the town south of Baghdad. Al-Qaida-linked militant Abu Musab al-Zarqawi claimed responsibility for both attacks, the latest in a series targeting high-level government officials. The bombings also seemed a deliberate effort by insurgents to mark the anniversary of the coup that brought Saddam Hussein's political party to power in 1968. Insurgents have intensified their assaults in recent days against members of the interim government and Iraqi security forces, whom they view as tools of U.S. forces. Militants killed the governor of Nineveh province on Wednesday and attacked a car Thursday belonging to Foreign Minister Hoshyar Zebari, who was not in the vehicle. "There are people who want to stop the progress of democracy in this country," said U.S. Army Col. Michael Formica, commander of the 1st Cavalry Division's 2nd Brigade, who spoke to reporters at the scene of the attack on al-Hassan, the justice minister. The suicide bomb gouged a crater into the pavement, and flames lapped the charred skeleton of one car, while a second burned nearby. A helicopter hovered above and emergency workers loaded a limp body into the back of an ambulance. Among the dead was the minister's nephew. In claiming responsibility for the killing, al-Zarqawi described al-Hassan as a "traitor ... in the apostate agent government." Al-Hassan's son, Haider, reacted with anger. "Those criminals seek instability in this country, so they can destroy this country and kill innocent Iraqi civilians," he said. Later Saturday, a Web site statement signed by the military wing of al-Zarqawi's Tawhid and Jihad group claimed responsibility for the Iraqi National Guard bombing and vowed to continue attacks. "We assure all Muslims in Iraq and the world that we will not become tired or weary in targeting the enemies of God, the infidel crusaders, the apostates and their followers," the statement said. Shortly after the attack on the justice minister, insurgents set off another explosion targeting a police patrol near al-Hassan's house, badly injuring two police officers, said police Maj. Hashim Raed. The explosion was part of a wave of attacks against police Saturday. In the Mahmudiyah bombing, Iraqi troops stopped the car at a checkpoint after becoming suspicious and shot at the driver, who set off the blast 15 yards from the building. Militants also attacked and killed Lt. Col. Rahim Ali, the Iskandariyah police chief, as he drove to work Saturday, said Lt. Ali Obeid, a police officer in the town. In Hawijah, 30 miles southwest of Kirkuk, gunmen opened fire on a police station wounding two officers in a 30 minute gunbattle, said police Col. Sarhat Qader. 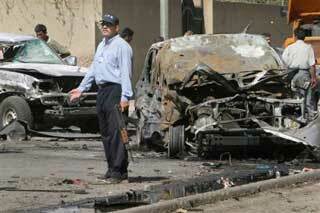 In western Baghdad, a roadside bomb exploded near a police vehicle, wounding four officers, police Lt. Alaa Adnan said. Also Saturday, a security officer who guards oil infrastructure in the north was kidnapped, police said. Farhat Abdullah was on his way home in Kirkuk when he was snatched by men in two sedans near Rashad, 40 miles to the north. The employer of an Egyptian man held hostage by insurgents told Al-Jazeera television that he would be freed Sunday, days after the company said it had agreed to an insurgent demand to leave Iraq. Al-Jazeera played a video Saturday showing Alsayeid Mohammed Alsayeid Algarabawi kneeling in front of four masked men, some of whom held guns. The group holding him, the Iraqi Legitimate Resistance, had demanded the Saudi company leave Iraq within 72 hours. The group issued no specific threat. Saturday marked the 36th anniversary of the bloodless military coup that brought the Baath party to power in Iraq. Saddam became the second most powerful man in Iraq after the revolt, and took power 11 years later. Huge celebrations had been held during Saddam's time to commemorate the anniversary, but were swept aside after his ouster. However, supporters of his ousted regime have fought on, and authorities fear they have joined with Islamic militants to try to frustrate American efforts here. Elsewhere, authorities found the corpse of a Jordanian driver dumped alongside the Amman-Baghdad highway with his eyes gouged out, Iraqi police Lt. Col. Salah Mubarak said. The attack was viewed as another effort to intimidate truck drivers bringing goods into the country. U.S. Ambassador John D. Negroponte acknowledged Saturday that Iraq faced serious security problems, but he expressed hope the country could overcome them and hold its first democratic elections. "I think all the ingredients for success are there," he told reporters in his first news briefing since arriving here three weeks ago.